Mister Rogers arrives with an orange seed which he takes to the kitchen and plants in a small pot of soil. Showing an orange, he explains that the seed he planted can only grow into and orange tree. Mister Rogers cuts the orange in half to show the seeds before squeezing some fresh juice from one of the halves. Mr. McFeely delivers a film about how people make orange juice which he stays to watch with Mister Rogers. Following the film, Mister Rogers shares an orange with Mr. McFeely. At Chef Brockett's Bakery, Mister Rogers also gives an orange to Jose Cisneros who shows a cake made with orange slices and orange juice. Chef Brockett introduces a "new line of health foods" including tofu and other produces made from soy. Before Mister Rogers leaves, Chef Brockett gives him a package of soy pancake mix and Mister Rogers purchases a loaf of whole wheat bread. 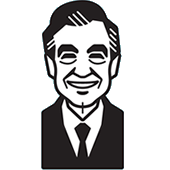 Returning to the house, Mister Rogers looks at his newly planted seed and talks about the importance of waiting. He then sings Let's Think of Something to Do. In the Neighborhood of Make-Believe, Lady Aberlin is sharing orange juice with the others in the Neighborhood. As she pours a glass for X, an Orange-O-Gram appears which shares the news that Cousin Mary Owl will be visiting tomorrow. X recites a poem about cousins which he has recently written. Back at the house, Mister Rogers talks about the joy that Lady Aberlin must have felt by sharing juice with her friends. According to the board behind the counter, Brockett's special of the day is orange cake. As the episode transitions to the bakery, Johnny Costa's instrumental Debbie plays in the background. This song can be found on the album Classic Costa. Special Thanks to Citrus World Inc., Tomoka Land Co.